The History of Fishing Museum is a unique tourist spot in the Ozark region where you can discover tons of interesting things all about fishing in Branson. The museum has the largest collection of antique fishing lures, reels, rods, boats and motors that are entirely collected by Karl White and his wife, Beverly. At the age of six, Karl had already began collecting things related to fishing in Branson when he bought the James Jeddon Crazy Crawler (the most expensive lure at the time). After nearly 70 years later, this lure is still on display in the museum. The History of Fishing Museum in Branson features more than 40,000 pieces and valued at nearly $5 million. It showcases the private collection of Karl and Beverly White comprising everything that is having to do with sport fishing including one of the first pairs of sunglasses. The collection of things that are related to fishing in Branson is considered to be the world’s most complete and diverse tackle collection. 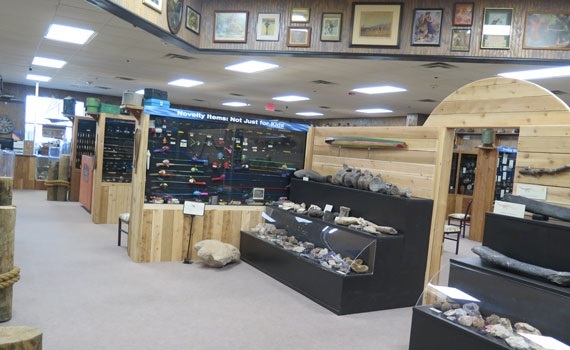 Many of the collectors specialize in one area only or one company but the collection of the White couple at the History of Fishing Museum represents that is “collectible” in antique tackle and other fishing paraphernalia including the first of many. Some of the items that are on display in the museum include the Spike reel from the 1730’s, the Snyder Reel from 1840, the 1859 Haskell Fish Hook, the Comstock Helgramite made in 1883 and the first ever Skeeter boat to come off the line. The Buel Trolling Spoon that was patented in 1852 is the oldest patented piece in the collection. The museum also includes collection of fishing artifacts that date back pre-colonial times, Native Americans and Eskimos. The Spike Reel from the 1730s, made in Europe is the first reel known to exist that was used by American Anglers. Snyder Reel from 1840 is the first Casting Reel made in the United States by George Snyder from Paris, Kentucky. As silversmith and watchmaker, Mr. Snyder made 12 reels for his family but only four known to exist today. Snyder Reels are the first precision free-running bait casting reels in the world. When Snyder Reel was bought by Karl White in 1997, its purchase price set a world record for the most expensive fishing tackle ever sold at an American Auction. The Haskell Fish Hook made by Riley Haskell in 1859 is the first American plug-type bodied bait. This hook is made with a metal body and a revolving tail. Its minnow imitation has dual hooks that point upward. The lure is made of copper, silver, brass and bronze. Comstock Flying Helgramite made by Edward Comstock in 1883 is the first wood plug ever made. Skeeter Boat is the first manufactured Bass Boat. It was Karl White who made the first Skeeter to come off the line. So, if you’re a fishing enthusiast vacationing in Branson, don’t miss to visit the History of Fishing Museum as you’ll get to discover interesting things all about fishing in Branson.